that makes the heart soar! The original Canine Freestyle, incorporated in 1994. Home of CanineFreestyle DogWork®. Combine the Federation's training discipline, based on mutual respect and teamwork, with creativity and artistry, and experience the magic of DogWork. It provides an excellent medium to illustrate the conformation and movement of the dog. The reach, drive and beauty of an athletic, trained dog moving to music can take one's breath away. For more videos visit the Federations Performance Stage. The Federation Performance Stage is a showcase of DogWork presentations at all four levels of competition. The performances may include Individual Dog and/or Multiple Dog Divisions. The Multiple Dog Division includes Team, (two or more handlers each with a single dog), and Brace (one handler with two dogs). Find a good seat in the front row. Enjoy the presentations of these amazing teams! 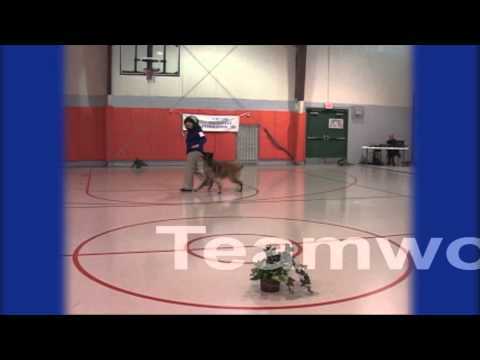 Each presentation illustrates the wonders and unique qualities of each dog and handler team. Note the joy and delight the dog and handler have in working together. This is a result of the mutual trust and respect developed in the DogWork training, with the handler supporting and enhancing the canine partner to present the dogs best attributes. Check back often, we will periodically change and update the performances. You may be gone, but for those of us who were fortunate enough to know you, your passion for our sport, your beautiful presentations and dog training accomplishments at the highest levels, your penchant to laugh at yourself, and the joyful relationship you radiated with your dogs, you will never be forgotten. We now honor your memory and all your time and energy that you so generously gave to The Federation as a teacher, a mentor, a judge, a board member, a student, and as a good friend, with the Sally Kirschenman Award for High Score in Show at each of our titling events. Thank you for giving so much of yourself and for inspiring us to always try to be our creative best. Join us in Ohio for the Carolina Canine Freestyle Guild/Sirius Guild joint Titling Event. Spectators are most welcome and guaranteed lots of inspiration!